Synchros are used to transmit angular data electrically from one location to another, where a high degree of accuracy is required. 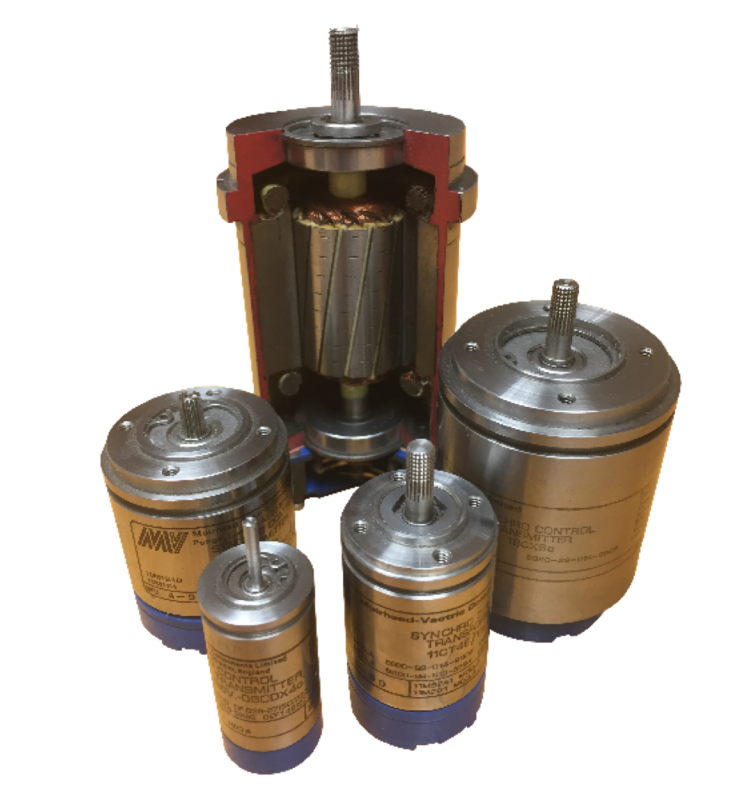 They are essentially variable transformers in which the coupling between windings varies with the rotor position relative to the stator. Several different types are produced to suit particular applications and whilst their external appearance is similar, the internal construction varies to optimise the unit’s functional requirements. Our pedigree and capability in the field of Synchros will ensure the most demanding specifications are met. Typical applications include remote positioning of low torque mechanisms, remote control by servo motor driven mechanism, remote digital measurement of angle via a suitable signal converter, remote pointer indication of angular position. It is sometimes necessary to add or subtract additional information from a Synchro Chain and Differential Transmitters serve this purpose. They are similar in construction to the other elements except for a 3-phase winding on the rotor. The design principle of a Control Synchro is to minimise errors in the output signal due to current loading, magnetic non-linearity and temperature rise, using high impedance windings and special attention to the magnetic circuits. The Control Transformer which provides the error signal to a servo amplifier, can be considered a ‘null’ detector and it is most often used in this way. However, the ‘null’ is never zero due to residual voltages. This is due to stray couplings within the laminated stator that result in an in-phase voltage, a quadrature voltage, both at fundamental frequency, plus several harmonics. These residual voltage levels are quoted in the performance data tables for each unit. The Torque Synchro is designed to provide a light torque output without additional servo components. Current is fed to both the Transmitter and the Receiver from the same source and the winding impedance values are considerably lower than the equivalent control element. Torque is generated because of interaction of the stator field and rotor field in the receiver which drives the rotor of the Receiver into alignment with that of the Transmitter. The torque / misalignment curve takes sinusoidal form through 360 degrees with maximum values of opposite polarity at 90 and 270 degrees.